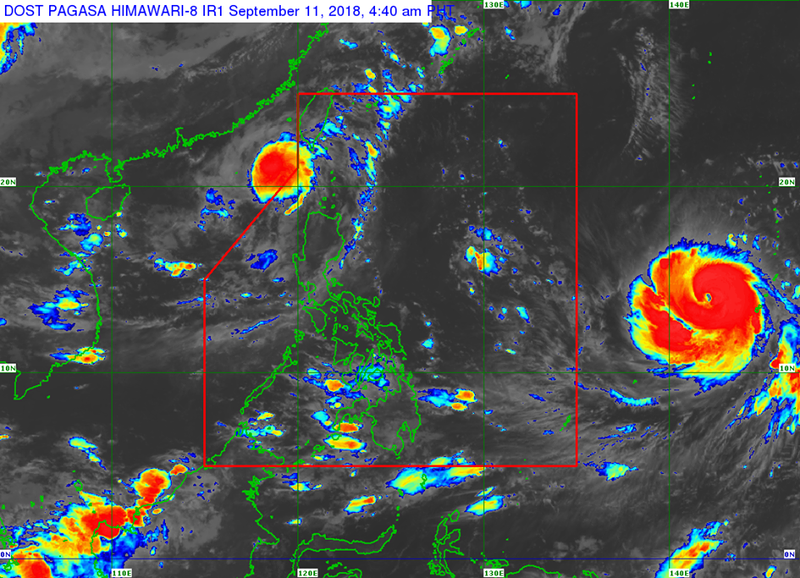 MANILA, Philippines – 'Bagyong Neneng' has slightly intensified and now outside the Philippine Area of responsibility (PAR), state weather bureau PAGASA announced in its 5:00 am update on Tuesday, September 11, 2018. Tropical Cyclone Warning Signal (TCWS) #1 has been lifted over Batanes. At 4:00 am today, the center of Tropical Depression "Neneng" was estimated based on all available data at 295 km West of Basco, Batanes. It has maximum sustained winds of 60 km/h near the center, gustiness of up to 75 km/h and moving West Southwest at 20 km/h. The trough of TD “Neneng” will continue to bring scattered light to moderate to at times heavy rains over Ilocos Provinces, Cordillera Administrative Region and Cagayan Valley. Residents in these areas, especially those living near river channels, in low-lying areas and in mountainous areas, are advised to take appropriate actions against possible flooding and landslides, coordinate with local disaster risk reduction and management offices, and to continue monitoring for updates. Meanwhile, the eye of potential super Typhoon 'Mangkhut' (international name) was located based on all available data at 1,820 km East of Southern Luzon with maximum sustained winds of up to 160 km/h and gustiness of up to 195 km/h. It is moving West at 30km/h. 'Mangkhut' is expected to enter the PAR tomorrow (Wednesday, September 12) and will be named 'Ompong'. It may pass through the Cagayan-Batanes area around Saturday and exit PAR between Saturday and Sunday.